Want to know what you're really getting with BARBRI Bar Review? 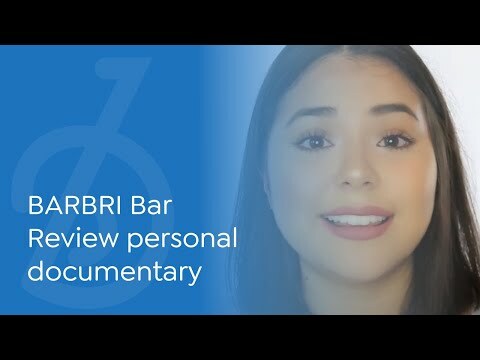 Watch this personal documentary from BARBRI student Kayla Reyes. I was one of the students who thought long and hard about which bar course to take. While my friends had already squared away their courses a whole year before the bar, I was still on the fence just three months before the exam! The BARBRI course was a perfect blend of self-study and more structured lectures. Sometimes I would need to sit in a classroom with other students to fully absorb the material. Other times, I was fine studying alone, and BARBRI offered that option. But I have to say what I found most useful were the 30-minute lectures on essay writing. Getting the right attack plan for each essay topic was absolutely crucial to writing effective, well-reasoned essays. BARBRI is definitely the only course I'll be recommending. I wanted to just thank you for all of your help and for answering so many of my incessant questions. I can't tell you how much I appreciate it. And while BARBRI is one of the more expensive bar prep courses, I can definitely say it's worth it. Your team was so responsive and I know that I would have felt even more stressed and unprepared without your help. Thank you again for everything. I sat for the Delaware Bar for the first time and am happy to say I passed. Thank you BARBRI! I was able to study from home, at my own pace, and I made it. BARBRI online lectures were very informative and motivational. The professors highlighted exactly what to focus on for the exam and I did just that. They not only taught the law, they were encouraging and made me feel like I was not alone. I walked into the exam feeling confident that I knew enough to make it. My thanks to: Professor Paula Franzese with her songs, she made me love Property Law again. Professor Epstein with his Armadillo from Texas, helped me remember how to apply all the rules of contract law. Finally, my favorite Professor who helped me stick with it, Professor Chuck Shonholtz! The man is brilliant and just amazing. The BARBRI App for my iPhone was also very helpful. I could go for a run and take the lectures with me. I could leave my study zone without my books and still have valuable information. Lastly, the state specific essay questions and detailed answers saved me. I reviewed ALL past exam essay questions and answers. Thank you BARBRI for helping fulfill my dream of being an Attorney in Delaware. The benefits I received from the Personal Study Plan were "confidence" and "an abundance of preparation," among other benefits. The practice questions BARBRI offers are very, very useful, particularly the answers to the practice questions, which provide robust analyses. Online, I'm able to rewind, pause, speed up, and overall manage the time in which I get through the lectures, which allows me to review things I might have missed or need to hear again, or speed through or skip parts the lecture in which I have a firm handle on the material. Take down time to clear your mind. It's ok to watch TV a couple hours in the evening before bed. It helps to not get burnt out. As I went into the bar exam, I felt like I did everything possible to succeed. In the final review week, everything that I wasn't confident about before began to click and I realized why BARBRI works! BARBRI instructional videos were engaging and highlighted the subjects that appeared on the bar in an informative yet interesting manner. The review videos were particularly helpful for classes that I did not take in law school that still appeared on the bar. BARBRI essay feedback provided me with valuable essay writing experience that gave me the skills I needed. BARBRI's review course came with thousands of helpful MBE multiple-choice review problems. Each problem contained a detailed answer and analysis. A heart-felt and sincere thank you to BARBRI for allowing me to fulfill my dream of passing the bar exam! For those of you considering which bar prep course to take, you can stop thinking about it. BARBRI gave me more practice essay questions and MBE questions than I could ever do in one summer. Their outlines were comprehensive and also practical-- I actually already used some of what I learned in their PA civ pro lecture since I started practicing law. Further, I received timely personal responses to every question I asked. I would take the course again if I ever decide to practice elsewhere. Passed the New York Bar. BARBRI was worth every penny. I just passed the California bar exam on my second try, thanks in large measure to BARBRI's support. I leaned heavily on BARBRI's resources - and it paid off. The video lectures and Conviser Mini Review helped me to internalize the vast amount of information tested on the exam, while the multiple choice and essay practice questions forced me to organize my thoughts and empowered me to excel on game day. I am immensely grateful for BARBRI. If you are considering other bar prep programs, stop now. Go with BARBRI. You won't regret it. I couldn't imagine preparing for the bar without BARBRI. The BARBRI attorneys take care of the hard part. They provide the pace and structure you need to succeed, all you have to do is follow directions! I just wanted to say thank you to you and the entire BARBRI staff for all your help and support. I'll definitely recommend you to future bar exam takers. I've seen the competition firsthand, and can say from experience that BARBRI is a better choice than its nearest competitors. The lecturers are more engaging and better informed, and the online interface is more comprehensive and user-friendly. BARBRI kept me motivated and confident throughout the process, and the results showed! It was really great to have the material broken down into an organized, entirely manageable schedule. The lecturers were extremely effective, not to mention entertaining! The study questions in BARBRI AMP helped me build a solid foundation, while the graded essay program enabled me to master essential details and fine-tune my bar exam essay writing skills. I particularly enjoyed being able to go to bed each night and wake up each morning with 30 MBE questions on my iPad or iPhone. Wherever I went, out to lunch or while waiting at the dentist's office, BARBRI was with me to work on the MBE. I felt challenged, but never overwhelmed, and the personal contact with BARBRI's management team was invaluable. Overall, having a team of experts to break down, and more importantly, prioritize and organize, the massive volume of required information was what allowed me to #ownthebar! I took your course this summer, and passed the bar. Your lecturers are what made this happen. I have an extremely hard time studying and have little discipline when it comes to book study -- however, I love listening to lectures. My main mode of study was listening and re-listening to the lectures, all day, anywhere. I loved the mobile app. Having the lectures readily available on my iPad allowed me to rewind and review, as much as I wanted. Your lecturers are absolutely amazing. AMAZING. Paula Franzese, Kip Cornwell, Rich Freer, all the others -- just, no words, only immense admiration for and gratitude to them. I learned a vast deal more from them in hours than I learned in law school in years. Just incredible professors -- brilliant experts not only in their fields but in the way the student, or rather the human, brain works -- their humor and tools to retain that huge amount of information worked WONDERS, and I love them all so much. I was unsure about spending that sort of money on BARBRI, but you were worth it all -- you are the reason I passed the bar exam!!! I came to BARBRI after I had taken a bar review course from a competitor. While the competitor did have outlines, essays, and practice MBE questions as advertised, they did not match the quality and detail of BARBRI's study material. BARBRI's advantage comes from the years of experience that goes into crafting a comprehensive curriculum. I had an endless amount of material at my disposal with thorough explanations that helped me focus my attention to critical areas. Most importantly, I never felt lost at any point of the process. Answers to essays and multiple-choice questions were well explained. If I was really stumped, I could always count on the feedback from BARBRI graders. Having this peace of mind during the lead up to the bar exam allowed me to focus during the exam. I felt totally prepared for the MBE portion of the exam. Some people say that the bar questions look different than the practice questions, and I couldn't disagree more. The BARBRI questions looked exactly like the real thing, so when I saw them I was not intimidated at all, and I felt very prepared. 2/2 on bar exam (SC and MA) using @BARBRI. Completely endorse them as the best bar prep company. I need a schedule like the Personal Study Plan to organize myself and I felt it worked for me. All the materials complement themselves – so the student learns from answering questions, attending the lectures and reading the mini review. Thus, do not expect to get all answers right when answering them. New PA Attorney here and I can honestly say that BARBRI is responsible for much of my success with passing the exam on the first try. The study materials contained endless amounts of practice so I never felt like I couldn't strengthen those areas where I was weak--also, the BARBRI staff is always available, day and night, to answer even those questions I felt were a bit silly. THANKS BARBRI! BARBRI gives you all of the tools you need for success on the bar exam. The thorough materials you receive at the beginning of the summer provide you with ample study guides and realistic practice materials. The daily study plan assures you that you are staying on track with your studying. This combination of well-developed tools allows you to feel as confident as you possibly can when you walk into the bar exam. My experience with BARBRI was amazing. I unfortunately did not pass the bar the first time I sat for it. When I took the bar exam the first time, I had taken a competing, cheaper review course which was a mistake on my part. The second time I took the bar, I took BARBRI and I felt much more prepared. After taking the BARBRI course in 2013 for Pennsylvania and New Jersey, I was confident that BARBRI would also help me pass the Delaware exam and I was correct! I was also thrilled to find out that I received a 162.5 (scaled) on the MBE this July. Since I was also working full-time while studying for the bar this time, I really credit BARBRI for keeping me organized and on track with studying. After graduation from law school in June, I felt very overwhelmed with the amount of material that I knew would be covered this summer in preparation for the bar exam. However, after getting started with BARBRI, I felt so much better! BARBRI told me exactly what I needed to do each day to make sure that I would be successful. I specifically appreciated BARBRI's compilation of past PA essay questions and answers, as well as their amazing essay feedback program - many of the actual questions on the July 2014 bar exam were nearly identical to previous years. I'm glad I invested in @barbri, they not only help in the classroom but outside of the classroom as well. Great tips and inspiration! I so appreciate how lovely and supportive everyone at BARBRI was during the psychologically grueling bar exam preparation process. I was particularly happy to have had the benefit of being able to email questions to BARBRI professors and to BARBRI attorneys and staff. I moved to Pennsylvania from Arkansas in May, and I was very frightened about whether I would be adequately prepared for the PA bar even. I did absolutely everything BARBRI asked of me during my study program. I felt prepared for the bar exam, and I went in knowing I was prepared as much as anyone could be. The results speak for themselves. I passed with many more points than needed, and my score on the essays, the PA specific portion, was well above the average essay score on the PA bar exam. I just wanted to let the BARBRI team know I REALLY appreciated all of the help, feedback, and guidance I received during my summer of bar prep. Thank you all so much! Hey @BARBRI, officially admitted to NY, NJ and CT. I blame you. BARBRI met and exceeded all of my needs and expectations for a bar prep class. The lecturers are both engaging and informative and the schedule is straightforward and manageable. The materials are also spot-on, so there were no surprises come test day. With BARBRI, I was confident that if I simply followed the path they had laid out, I would pass my local bar examination. Just set it and forget it.